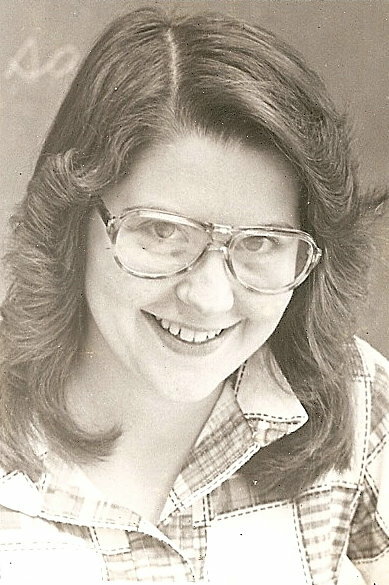 My mom, Susan, is one of the beautiful people. No, I don’t mean those fake, over-tanned, over-dressed, ultra-rich beautiful people. I mean, one of those real beautiful people: the people who look lovely outside and have exquisite beauty within. If you looked at my mom, you would just want to squeeze her. In fact, her second grade students often do! She is the perfect picture of someone’s favorite grandma. Her pretty brown hair is streaked with silver and her brown eyes shine when she laughs. Mom looks wonderful on the outside, but I think she must be a supermodel on the inside. Let me tell you a few “beauty tips” I’ve learned from mom. These beauty tips are far better than the fanciest skin care regimen you could find. They will never go out of style and will work for any age. I love to talk (I know that’s a shocker!). I’m a really good listener for around 5 minutes if you’re talking about something interesting. Not mom. I’ve seen her spend over an hour listening to people tell, what I think, are mind-numbing stories. Mom will nod, ask questions, and even give a hug to the other person if they need it. She always does her best to truly listen and offer help or a word of encouragement. Real beauty is taking the time to listen to others instead of always having to be heard. My mom taught school all the time I was growing up. Even though she was tired, she came home every night and cooked supper, helped me with my homework, did her own school work, and often found time to play a game or two with me. Going out to eat was a major treat for our family, not a lifestyle. As a child, I didn’t realize how much stability and contentment this gave my life. As an adult, I strive to follow her explain with my own family. As I mentioned earlier, my mom has always been a school teacher. She is one of those amazing teachers that change children’s lives because she truly cares about them and tries her very best to help each and every one of them learn. Teaching like this requires a lot of extra work. I’ve seen Mom spend weekends, summers, and late nights preparing lessons and activities for her students. When Mom does get a free minute away from school work, her time is usually spent doing something for her family. You should see the things my mom can sew! I’m not talking about a weekend crafter, I’m talking about someone who could have been a professional seamstress. With such sewing skills, you would think that Mom would have a huge custom made wardrobe. She doesn’t. Mom spends almost all of her time making clothes for her family, hats for the homeless, or blankets for newborn babies. Growing up, mom made almost all of my clothing. Now, my little girl is enjoying wearing clothes made by her. What a treat! In actions and dress, my Mom is modest. Even though Mom amazes me, she just waves her hand, and says, “I really don’t do anything special.”. Incredibly, she really means this! So you can see, my mom really is one of the beautiful people. She’s never won an award or received recognition for all she does. She’s never been on a fancy vacation or lived in a mansion. Mom’s never been rich and she’s never had a fancy car. Fake tans, designer clothes, and dyed hair have never been a part of Mom’s life. To me, that only adds to her beauty. If you look around in your life, I bet you can find some beautiful people to. They’re the ones that are always on the sidelines, helping the person in the spotlight to shine. They’re the ones that you go to when you need an ear to listen and good solid advice. They’re the ones that make your day a little brighter and bring a smile to your face. They are the beautiful people – inside and out. Take a moment to seriously consider the beautiful people in your life. If you haven’t already, talk to them and tell them how much you appreciate them. Tell them that you think they are beautiful! Mom, teaching school at age 20. The writing behind her head is on a blackboard. Aisle seven is the cleaning supply aisle. It’s the one that is filled from top to bottom with hundreds of bottles, sprays, and creams that promise to make your house sparkle, shine, and smell sensational. You can easily spend a small fortune on these products. However, there is a different one. It’s an old fashioned modern option called “Make Your Own”! Step into the farm kitchen with me and see how easy it can be to make your own cleaning supplies! Here are some of my favorite recipes for cleaning supplies. I love hot, soapy, water for cleaning my countertops, but if you prefer a countertop spray, you can mix vinegar and water together in a spray bottle. I mix one cup of vinegar with four cups of water. You can make the cleaner stronger simply by adding more vinegar. Simply sprinkle baking soda on the sink, tub, or shower and scrub with a wet cloth. Then, rinse. For tough spots, I make a paste with baking soda and water. Let it sit on the spot for a few minutes and scrub as usual. A mixture of warm water and vinegar is all it takes to keep our floors looking clean and shiny. You can wipe your floors with a cloth or a mop. Of course, you have to sweep them first before you mop. This is the same as the countertop cleaner. The more vinegar you add, the stronger the cleaner. I usually use one part vinegar to four parts water. Sprinkle a little baking soda on your carpet and let it sit for 10-15 minutes. Then, vacuum. This will help neutralize any odors. You can also sprinkle baking soda in your trash can to get rid of smells. If you are able to compost food scraps instead of putting them in the trash can, this will really help your trash to not stink. Drop two or three denture tablets in the toilet. Let them dissolve, and then scrub as usual. This will help your toilet bowl to be sparkly, shiny, and minty fresh! Make a glass cleaning solution by mixing two tablespoons of cornstarch to one quart of warm water. Wash your mirror or window with the solution. Rinse out your cleaning cloth with clean water and wipe the window or mirror with the clean water. Then, rub the window or mirror dry with a soft cloth. This literally comes out to cost pennies a load! Mix all ingredients well and store in an airtight plastic container. Use ¼ cup per load of laundry. Add ¼ cup of white vinegar to the rinse cycle of your washer. To make your house smell like freshly baked goodies, how about actually baking some? Then, your house will smell great, and you’ll get a yummy treat after all your hard work! Now that you see how easy and inexpensive it is to make your own cleaning supplies, you may never see aisle seven again! So, goodbye aisle seven, hellooooooooo old fashioned, modern clean! 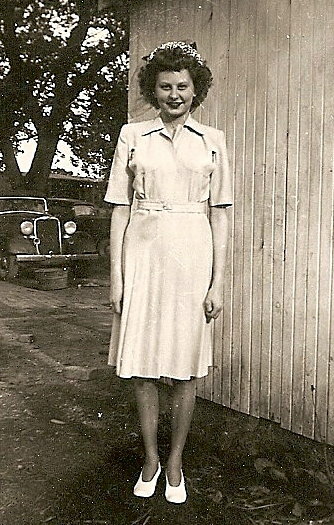 This story was inspired by my Grandma Dorothy, who is pictured above. Grandma Dorothy is the best house keeper I have ever met. She owns at least three vacuums (which have three different cleaning purposes) and dust screams at the mention of her name. I always see her in the morning around 6:45. It’s the time of day when the sky is filled with a beautiful glow of pink and purple ribbons as the sun starts to spread across the sky. As I open my car door, before I climb inside and start the 25 mile drive to work, I pause and look out over the fields. As I gaze at the quiet landscape and breathe in the cool, crisp morning air, I see her coming. She’s walking steadily, and quickly, with her skirt swishing about her legs. A book is tucked under one arm, and a lunch pail is swinging by her side. I blink, and just as quickly as she came, she’s gone. Who is this beautiful lady, and why is she walking across our field at 6:45 in the morning? The answers to those questions, lie in a time many years ago. The beautiful lady is Joey’s Great-Great Aunt Bea. She was the school mistress at the Crossroads School. The Crossroads School is a beautiful, old, one-room, rock school house. It stands right next door to our farm. Of course, it hasn’t functioned as a school for many years, and is currently serving as a house for an older couple. It’s been added onto over the years, but the basic structure still remains. When you drive by, on the way to the farm, you can easily point it out as an old school. Back many years ago, almost every little community had their own one room school. The teacher personally knew each student and their family. The school was the heart of the community. From spelling bees to box suppers, it was a cherished place. Over the years, these tiny schools and communities disappeared as transportation and roads improved. Many folks stopped farming and began to find work elsewhere. Students moved away. “Progress” moved us forward into modern times. I often think about the one room school, and wonder about that word, “progress”. Has it been progressive to bus children for hours each day instead of letting them walk a mile down a gravel road? Has it been progressive to take away any mention of Bible stories or prayer, but to try and teach character and values? Has it been progressive to legislate and mandate when, where, and how every single idea must be taught? Has it been progressive to not use multi-age groupings, where each child can learn at their own pace in each subject? If you are sitting on our front porch, you can look through the woods, and just catch a glimpse of the old rock school. 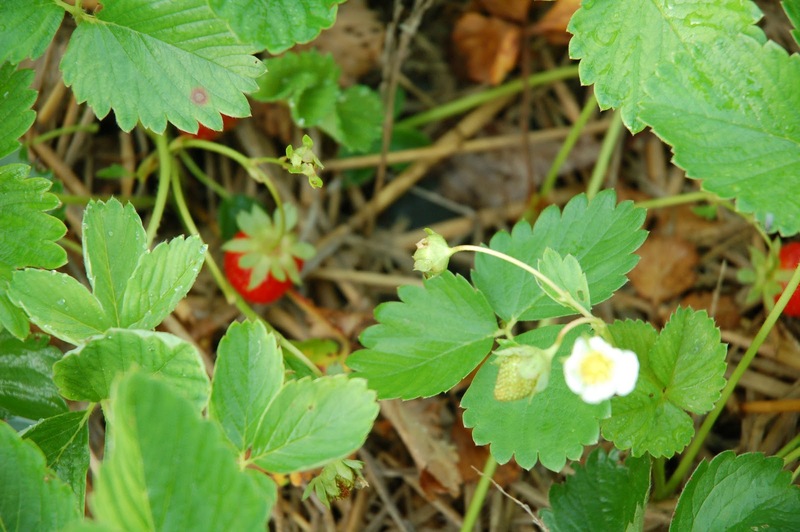 A part of our garden was the baseball field where the kids played ball at recess. I think about all the little feet that made their way down the road in front of the house; all the lessons the children learned next door in reading, arithmetic, and real-life; the spelling bees and community events that were held; the families that came together to fellowship and celebrate education. Most of all, I think about Aunt Bea, and what it would have been like to teach at the Crossroads School. If you’ve read my other articles, you know that many times, here on the farm, the past and present blend together in an old fashioned, modern way. That’s probably why I have to ask myself this question: “Could the old, one room, Crossroads school, still function as a modern one room school today?”. While many eschew the one room school house as a thing of the past, I believe that it could function now – in a delightfully old-fashioned, modern way! For the old-fashioned part, I still would have a multi-aged grouping of students. This type of grouping allows students to learn at their own pace. As a Christian, I also love the idea of a Bible story and a prayer each day. Since play and fresh air are vitally important for children, three recesses a day would be a must. Traditional subjects, such as arithmetic, reading, and spelling, would still be sticking around. And then came “progress”… Only this time, it’s in a good way! For the modern part, you wouldn’t find any old blackboards or slates in this one room school. Instead, students would use beautifully colored workbooks, paper, and of course, digital tools! Computers would be a big part of the modern, one room, school house. With computers, virtually any subject area a student might wish to learn about, could be easily explored. Another beautiful thing about my old fashioned, modern, one-room school would be the location. If we were studying about animals or Earth Science, an immediate field trip could be taken, simply by stepping out the door, and over to the farm! I know, I know…I need to come back down to Earth. Some of you are probably turning pale, contemplating insurance and legal issues with my old fashioned, modern school, that I’ve never even thought about. Don’t worry. My little school is only a dream in my imagination. Speaking of imagination, just in case you’re wondering, I haven’t really ever seen Aunt Bea walking across the field in the morning. But sometimes, I’d like to. If I ever do, I think I will stop her, and ask her, just what she would think about an old fashioned, modern, Crossroads School. I think, she would highly approve! Besides being the school mistress at the Crossroads School, Aunt Bea was also a very talented seamstress. She sewed many beautiful wedding dresses for the young brides around the area. I love old things. In this day and age of cheap, plastic, throwaway items, it’s refreshing to find something old and solid, that was made to last. Most older items were made with care right here in the United States. They were functional, beautiful, and purposeful. What a wonderful combination! Outside on the farm, and inside the farm house, old items abound. They aren’t valuable antiques that sit on a shelf, just good old items that are priceless to us. Many have been passed down from one generation to another. One of my favorite items in the farm kitchen is my Great-Grandma Bessie’s earthenware bowl. In the 1940s and 1950s, she normally used it to make cottage cheese in each week on her farm. Today, I use it for everything from muffins to meatloaf. Every time I get it out of the cupboard, I see her face and feel such a strong connection to the past. As I mix and stir, my hand rests firmly on the edge of the bowl, just where hers used to sit. For a brief moment, I imagine that our hearts touch across the years; two women happily preparing good food on the farm for their families. As I cook, I tell my daughter Elizabeth stories about her Great-Great-Grandma Bessie and her famous hot rolls and fried chicken. Elizabeth has joined me as I’m writing this, and says that I need to mention one of her favorite old things. She loves to cook as much (or maybe more!) than I do. At five years old, one of her most prized possessions is her 1955 Better Homes and Gardens Junior Cookbook. 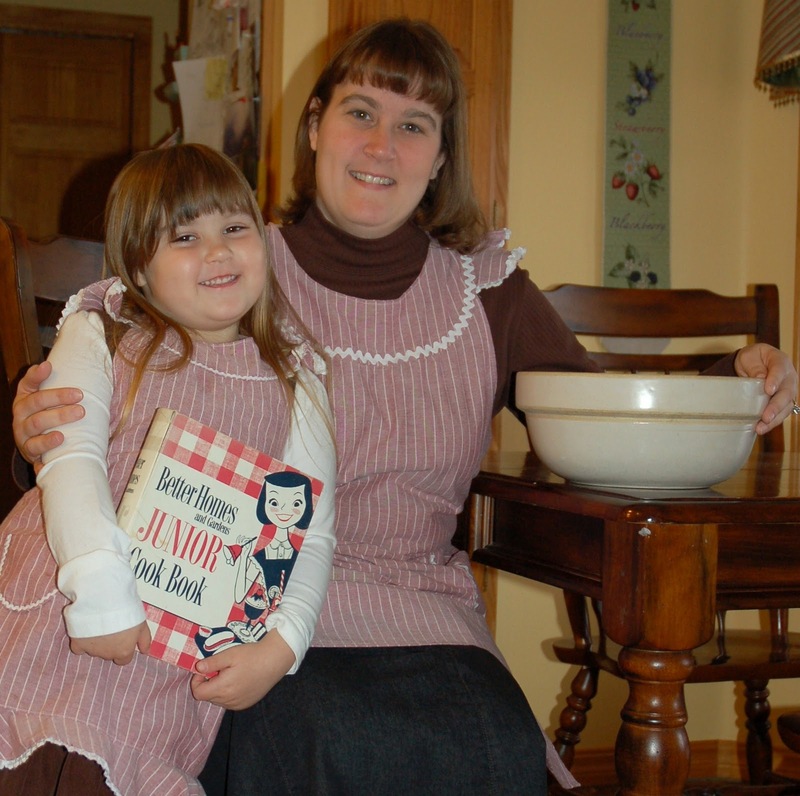 Whenever we’re undecided about what to make for supper, she usually whips out this little red and white checkered book and begins searching for ideas. She is also very enamoured with old children’s stories. Right now, we’re on our second read of The Boxcar Children, which was published in 1942. Elizabeth and I with our treasures. My mom made our vintage style aprons. Another treasured old item inside the farmhouse was given to us by Joey’s mother. It is a small blue ledger dated 1946-1947. Our farm has been in Joey’s family for well over 100 years. This particular ledger was kept by Joey’s Great-Great Grandfather J.T. Lovelace. Reading the old entries in this ledger reminds us that we are not the first, nor will we be the last, to care for and improve this land. We take this responsibility very seriously and use organic practices and common sense methods to keep the land healthy and strong. When I asked Joey what his favorite, old, outside farm item is, he laughed and said, “Everything we’ve got is old!”. 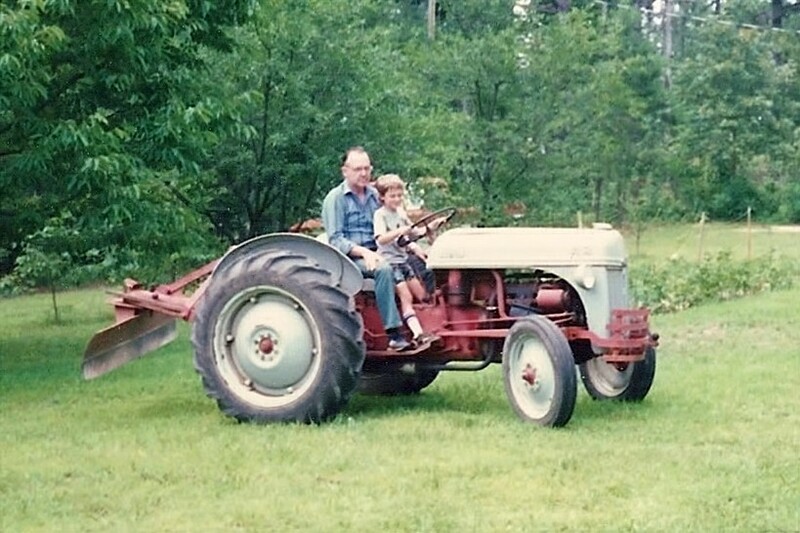 When I pinned him down to choosing one item, he said that it would have to be the 1947 Ford 8n tractor. He enjoys the 8n because, after 65 years, it’s still doing exactly what it was designed to do – make the farmer’s life easier. Joey and his Grandpa Howard on the old 8n around 1986. His second favorite outside item is his great grandma’s old wheelbarrow. Joey’s great grandma was known to everyone as “Granny”. Granny was a true blue farm lady and grandmother. Our farmhouse stands in the very spot where her house stood, and part of our garden actually was hers. Joey loves her wheelbarrow for gathering and washing potatoes. Every summer of his life, he and his family have dug the potatoes, put them in the wheelbarrow, and sorted and washed them under the big oak tree in the backyard. The tradition still continues today. 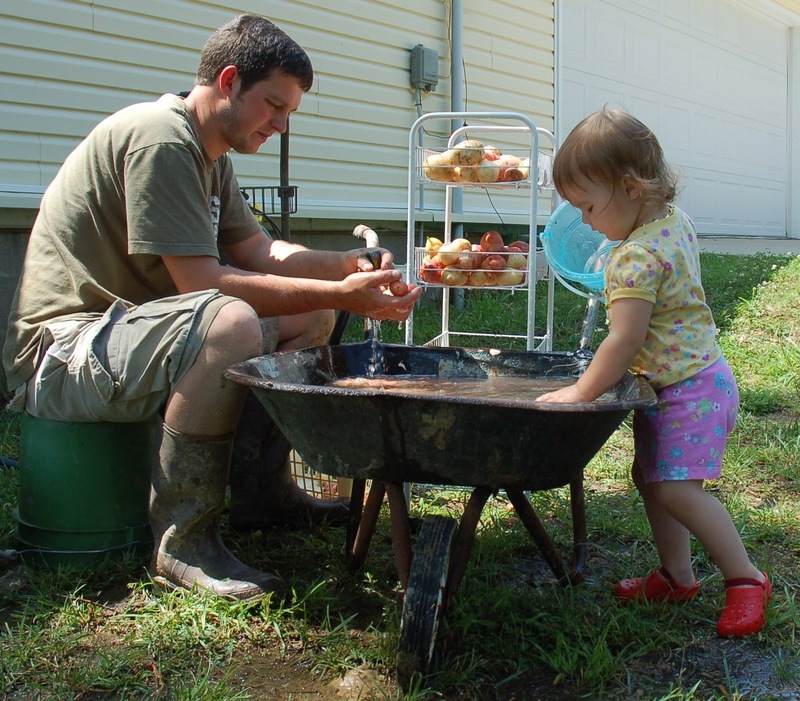 Joey and Elizabeth using Granny’s old wheelbarrow to wash potatoes. At our farm, inside and out, old things are still alive and well. Time seems to slip away and the years between the generations grow hazy as you return to a simpler way of life. Elizabeth runs happily across the same fields that her Grandma Charlene did when she was a child. Joey’s hands work the same soil that his great-great grandfather did. I enjoying watch them out the farm kitchen window while I’m stirring up a cake or a batch of cookies. My hand rests on the side of the earthenware bowl as I stir, and I smile and begin to sing, “In the Garden”, which happened to be, Grandma Bessie’s favorite song. *After reading the above article, you can probably tell, that one of our favorite decades is the 1940’s. We recently found an incredible project created by Joe Wertheim. You can check it out at http://victorygardenoftomorrow.com/. We love his work! It all started one hot summer day several years ago. I was lying on the couch trying to recover from a cesarean section and was feeling rather sorry for myself that I wasn’t able to just jump up and do whatever I wanted. My dad, who has a registered nursing degree, had come over to spend the day with me to help me with my new little one. Dad, with all his professional care giving experience, tried to suppress a grin. He assured me that I most certainly would feel better and would most definitely not be stuck on the couch for the rest of my life. Then, he told me a story that has stuck with me ever since. This story has changed my life in so many ways. At times when I am struggling, or feel overwhelmed, I see Dad out there, pale and thin, crawling along, doing what needed to be done. He just kept going. He could have laid in bed, probably should have laid in bed, but instead, he chose to hold his head up, throw his shoulders back, and keep going. He had cantaloupe to plant. So, what about you? Do you have cantaloupe to plant? We all have times where we have problems or situations that seem to completely overwhelm us. Be strong, keep going, and start planting. 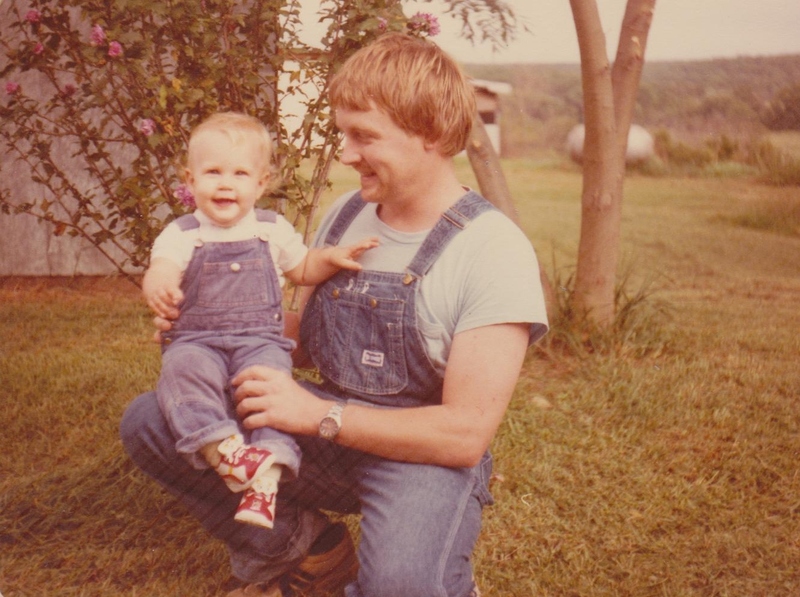 This is my Dad and I on the farm where I grew up. Let’s Bring Back the Mom and Pop Shops! Have you driven down a small town main street lately? Was it pretty bare? Many around our area are. What happened to all the little shops? You know the ones I mean – the mom and pop shops where the owners knew your name, could practically guess what you’d come in to buy, knew exactly where it was, and could tell you almost anything you wanted to know about it. You may have one of these shops in your area. We are blessed to still have quite a few. When compared to a modern big box store – well, there actually is no comparison! How can you compare a small comfortable shop with a large, concrete, million foot structure; a greeter who says hello to hundreds of people, to someone who knows your name; aisle after endless aisle of imported products from China, to carefully selected products – including locally made items; a tired check out clerk who only accepts cash or credit cards, with a friendly shopkeeper who accepts cash, credit cards, or who might even be willing to barter or trade goods or services? There is simply no comparison. When I leave my favorite local mom and pop shops, I usually have a smile on my face, have enjoyed a nice visit with the shopkeeper, and am pleased with the items that I bought. When I leave a big box store, I’m usually stressed, and somehow feel a little cheated. One of the biggest complaints I hear is that, “I’d shop locally at mom and pop shops, but I can’t afford it”. I think almost everyone has been in a tight spot before with finances. Sometimes we don’t have as much to spend as others and sometimes there’s no extra at all. What I personally find is that most of the time, the mom and pop shops have the same or very comparable prices to the big box stores. Many times, the big box stores don’t even carry the products that I want to buy. If the price does happen to be a little more, I’d rather pay an extra five or ten dollars to support a local shopkeeper than a giant corporation. Our farm is one of those little, local, small places. We aren’t a mom and pop shop, but we are a mom, and pop, and grandmas, grandpas, aunts, uncles, and cousins farm. We’re not fancy or flashy. Our tractor is from the 1940s and our equipment is either made by Joey from old scrap metal, or bought second hand. Just like the mom and pop shop storekeepers, we are so blessed to have a strong personal connection with our customers. Some of our customers even have fond nicknames. We have “the radish guy” and “the pepper man” that we see frequently. The thing is….most of our customers are not just customers. Sure, they started out that way, but they quickly became friends. It’s almost impossible to not become friends with someone when you see them every week and provide part of their weekly food supply. 99.9% of our customers are true blue, salt of the Earth people. They are the kind of folks what will stop to help if you have car trouble, the ones that show up at your door with a covered dish if you’re sick, and are, basically, just awesome folks! There’s always that .1% that are a little cantankerous, but we love them anyway! We whole-heartedly enjoy having a strong connection with the folks who love our produce and farm. At this point, are you thinking, “I would love to buy my produce from a farmer that knew my name, or do my shopping at a place where the shopkeeper was an old friend.”? Well, what’s stopping you? Go find one! You can help make an incredible change in your town just by changing your shopping habits. Start shopping at local farms and small businesses. Let’s bring back the mom and pop shops! What Exactly is an Old Fashioned Modern Life? Well, since I made up this description, you would think I would know, but actually, I’m still finding out. Honestly, I think I still may be finding out when I’m old and gray. I sure hope so anyway! For now, I’ll tell you a little about what an old fashioned modern life means to me at this point in time. Let’s start with the old fashioned part. On our farm and in our family life, we have many old fashioned things. Some of the most important things are our morals, values, and traditions; such as honesty, keeping your word, honoring God, being loyal and true, taking care of your family, and helping your neighbors. Of course, there are many more – really to many to list, but those give you an idea. It also means that we tend to enjoy old fashioned activities such as reading aloud to each other, singing, playing board games, doing puzzles, playing croquet, or pitching horseshoes instead of staring blankly at the television or the latest video game. That’s not to say that we don’t have a television. We do, kind of… Our computer is in our living room and we do enjoy watching programs on Hulu or other similar sites. We don’t normally watch hours of television at a time, and many days, don’t watch it at all. If you are looking for some extra time in your life, try turning off the television. It’s amazing what you can do with those extra hours! We are also old fashioned in that we have a very close knit family. We work, learn, and play together daily. Joey’s parents and my parents live close by and we see them almost daily. We are so blessed to be able to learn from them about everything from raising a family to working on the farm. We try to live an old fashioned lifestyle and be as self-sufficient as we can. This means that we do things like make our own lye soap in a cast iron kettle, we can and preserve most all of our food, and we make many of the things that we need for day to day living. Well, that about covers the old fashioned part, but what about the modern? Although we do love old fashioned things, the modern age has some pretty great things to! How about that indoor plumbing and running water?! Electricity, technology, and computers are all very much a part of our everyday lives. While many things from the past are still alive and well at the farm, we do realize that we live in a modern age with many wonderful inventions and ideas. Even though I am totally enamored with the idea of having a horse and buggy, Joey practically points out that I would not be enamored with the horse and buggy when I was making the 25 mile drive to work each day. Thank goodness for our modern vehicle! Sometimes, it’s a fine line to make the two worlds mesh, but they always seem to come together in the best possible way, which makes for an amazing old fashioned modern life!